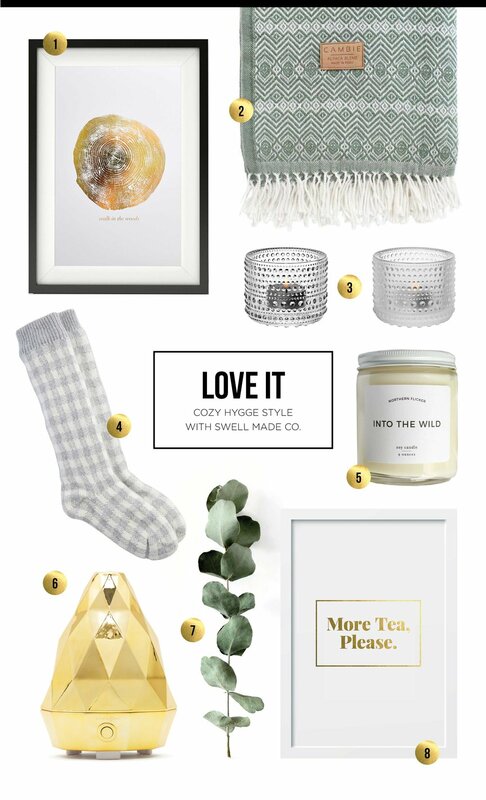 LOVE IT - Cozy Hygge style with Swell Made Co.
Hygge (prounounced hoo-guh) is the Danish term defined as "a quality of cosiness and comfortable conviviality that engenders a feeling of contentment or well-being." With the holidays past, but still many winter days and nights ahead, the concept of "taking pleasure in the presence of gentle, soothing things" is one that is welcome. A simple concept, that requires simple things to enjoy an understated luxury that brings much joy. As always, I love to keep things simple. Hygge is all about creating comfortable spaces in your home where you can enjoy the little things amongst family and friends, or on your own. Little things include a hot cup of tea or coffee (with sweets), lighting candles (many), reading a good book, enjoying the warmth of a roaring fire, soft lighting, getting cozy with knitted socks, sweaters and throws, soft and varied textures, and bringing outdoor elements in. Just to name a few. Walk in the Woods Art Print (11x14) by Swell Made Co. to bring the outdoors in. Sage & White Blanket by Cambie Design. Made in Lima, Peru this 20% Alpaca Wool throw is perfect to snuggle up in or use as a wearable wrap. Available in many stunning colour combinations. You'll want more than one. Kastehelmi Votives by Iittala. Inspired by morning dewdrops, the droplet design brings the outdoors in. Available in a fresh range of other colours inspired by nature. You'll need more than just one candle, after all! Gray Checkered Reading Socks by Indigo. Settle in for an evening of reading with these warm and cozy reading socks. Into the Wild Soy Candle by Northern Flicker Co. Soft outdoorsy scents and light will create the perfect Hygge atmosphere. Gold Aromagem Diffuser by Saje Wellness. Create a cozy atmosphere with a relaxing diffuser blend from Saje Wellness. 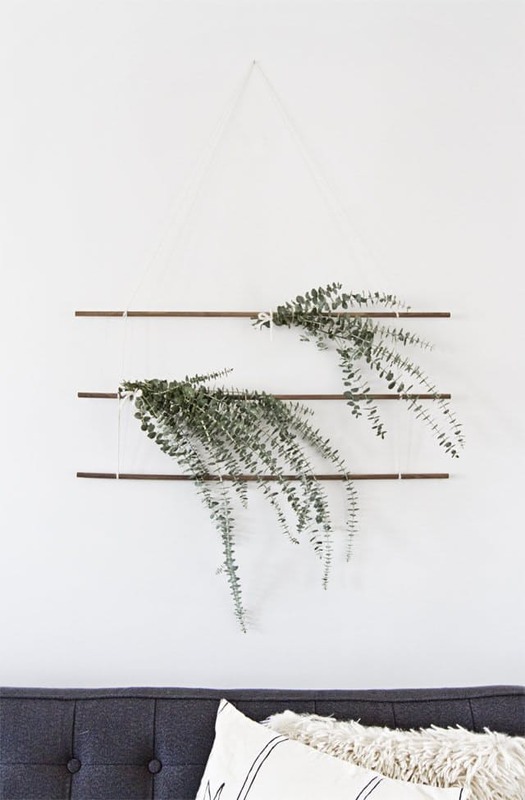 Bring the outdoors in with some fresh eucalyptus branches. Place in a simple vase, or try a DIY hanging as seen below. Photo by Mary Jo Hoffman of STILL Blog. More Tea Please Art Print (8x10) by Swell Made Co. 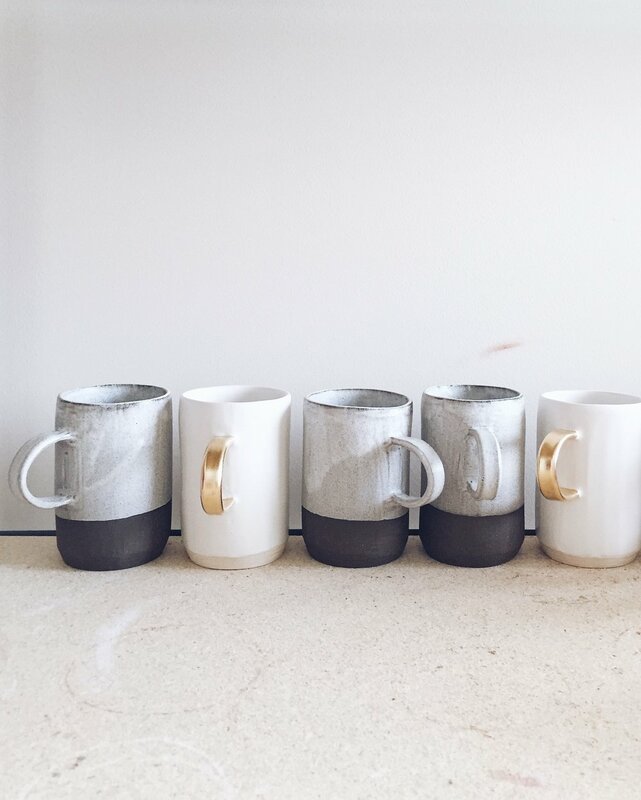 Follow Swell Made Co. on Pinterest to see more Hygge inspired spaces, products and DIYs like the ones seen below (click on images for links). Embrace the winter months ahead with a little Hygge!